From the start the Arab Revolt was remarkably successful. When Sharif Husayn ibn Ali raised the standard of revolt in June 1916 his forces immediately took control of the holy city of Mecca and the port of Jiddah, and laid siege to Medina. After that progress was slow but steady, with much guerrilla warfare against isolated outposts and the Hijaz railway, the fall of more ports, particularly Aqaba, and finally the push into Syria resulting in the fall of Damascus. The Arabs received some assistance from France and Britain, and in time a regular Sharifian Army was organised, but the bulk of their forces were made up of tribal irregulars, which presented major problems as their nature was for raiding and withdrawal rather than sustained warfare such as that required to expel the Ottomans. Yet such men contributed to the disintegration of the Ottoman Empire, which changed the face of the Middle East forever. Such men knew nothing of uniform, and the only uniforms most saw were those of the Ottoman forces. They wore their ordinary clothes, well adapted to the environment and climate in which they lived. Robes were long and loose, and many wore the classic kafiya headdress still much seen to this day. Differences between men might be based on tribal fashion, but more likely based on the status within the tribe, and on personal wealth, since the wealthy could afford fine silks in bright colours. All carried a knife, visible or not, and when going into battle a sword or firearm, the model and age of which ranged widely. The figures in this set fit that look very well, with each man being different from the next but all looking authentic. As well as blades many carry a rifle, which seems to be the Lee-Enfield which the British later supplied. Two obvious British donations are the Lewis light machine gun and the Vickers machine gun, both to be found in the third row. Everything here is accurately done and fairly typical for the subject, and we particularly liked the ammunition belts worn by many here. The poses include a lot of men firing their weapon, plus a couple charging forward with blade at the ready. There is nothing wrong with any of these poses - all are very suitable – but the execution is not so great. The three men with blades raised are particularly flat, and the man with the dagger is holding it directly over the middle of his head, an anatomically impossible position even if you wanted to do this. The rest are in poses where being flat is not a problem, and we particularly liked the Vickers team, especially the gunner who looks like he is actually aiming his weapon, something so many models of this weapon fail to do. The style of these figures is what you might call traditional Strelets, so they have a rather bulky feel to them, and the slimmer items such as scabbards and, especially, rifles, are much fatter than they should be and so look poorly proportioned. The exception is the Vickers machine gun, which is beautifully detailed and well done, in stark contrast to everything else here. Detail is good but often exaggerated because it cannot be made small enough to look correct. Also neither of the scabbards bear any resemblance to the shape of the sword which they are supposed to accommodate. We found no flash at all, so from a sprue point of view there is nothing to clean up here. For once we will mention the last, non-Arab figure in the review, because it is evident he was produced by a different sculptor. Unlike the rest he is well proportioned, slim and delightfully detailed, with a head much smaller than the rest and of the correct size for his body, so on this sprue he has the unfortunate effect of showing the rest of the figures in an unflattering light. Perfect accuracy is always good, and this set almost achieves it, falling down only with the Vickers, which is missing its condenser - surely never more necessary than in the hot environment of Arabia. The poses, if not always well done, include some reasonably dramatic ones even though the bulk of the men are just firing their weapons. 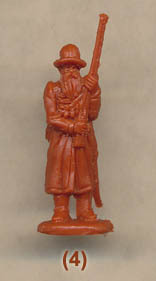 Aside from the lovely Streltsi musketeer these figures suffer from the old complaints of a fairly basic and chunky style and a few very flat and quite poorly executed poses. In that respect they match the previous set of mounted Arabs very well, yet are far poorer quality than the old Airfix set produced half a century earlier.